When you write about video games for a living, you get so many e-mails about how great certain new video games are that they can't possibly all be true. The people who send these e-mails are often being paid to tell me how awesome game x or y is. That's what we call unreliable sourcing. But, the person who recently e-mailed me about Fairway Solitaire played the ace and told me I really needed to trust her on this one. This game is the real deal, not just another boring free solitaire game for iPhone. She was right. This is a damn good game. It's a card game mixed with a golf game. It's mostly the former and requires you to try to clear out a batch of cards by flipping them and stringing them up or down in little straights. 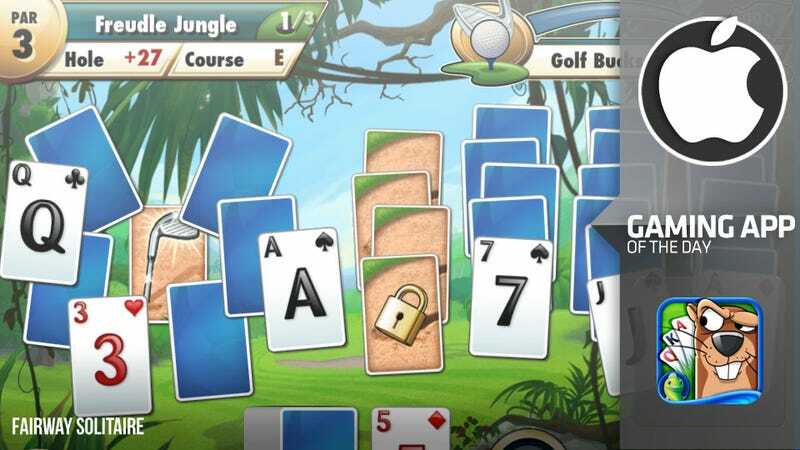 Each playthrough of a deck of cards should be considered a hole in one of Fairway Solitaire's golf course. Your goal is to play through that deck with as few cards remaining as possible. You're playing each "hole" for par, or hopefully getting under it, meaning you're leaving even fewer cards on the table... maybe none. If you're even or under par for the whole course, you unlock a new one. Those are the basics. They're made more interesting with clever riffs on concepts like sand traps, water hazards and shooting from the rough (for those, a card needs to be played twice to be fully used). They have putting, irons and more. It's all smartly done, but there's no reason for me to explain any more. The game's free. This game is the real deal, not just another boring free solitaire game for iPhone.